Agriculture Umudike (MOUAU) and Abia State University (ABSU) Uturu, has arrested four (4) suspects believed to be involved in the killing of three (3) students of ABSU Uturu in Isuikwuato Local Government, with two (2) of the victims beheaded. 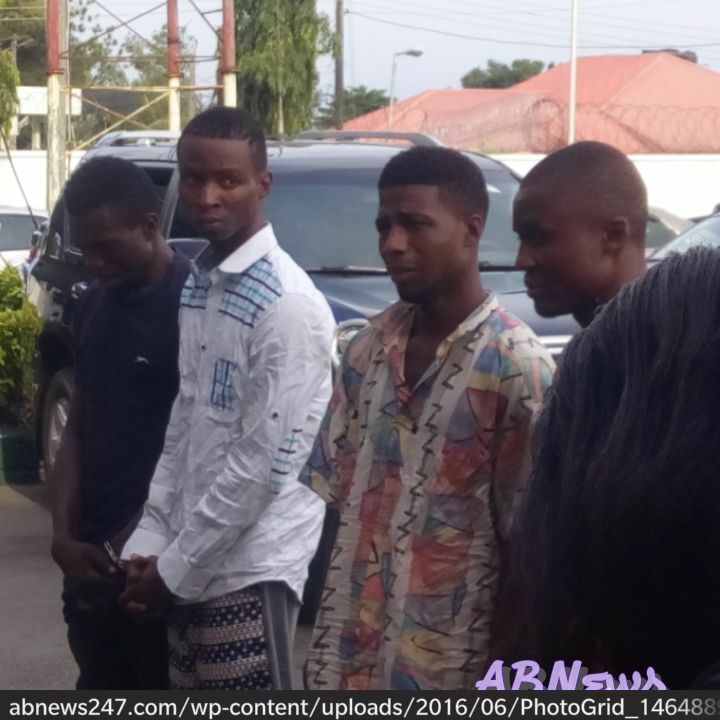 The above named suspects, were paraded at the Abia State Government House today June 2,who are members of Burkina Faso cult group planned/conspired with others at large and stormed the residence of their three (3) victims at Chido Lodge Uturu on 12th March, 2016, about 2200hrs during which two (2) of the victims namely EBUKA NWAIGBO and SAMUEL ETHELBERT CHUKA, who belong to the Maphite cult group were beheaded and only shot Isaac CHIGOZIRIM a member of Vikings who later died in hospital on 18th March, 2016. Abia Breaking News, gathered that the suspects who confessed to the crime narrated how the attack was planned and hatched. In his statement, MACDONALD who is present capon of Burkina Faso cultgroup in MOUAU, disclosed that the attack was planned in a hotel along Ikot-Ekpene road, via Umudike, where pledged to supply the gun to be used for the attack and a sum of six thousand Naira (N6,000) for logistics, but was only able to supply the gun. He, however, stated that he did not take part in the attack. In his own contribution,AWOM(a.k.a Arch Angel) stated that the attack was a reprisal meant to avenge the death of Collins Agwu Kalu (a.k.a Biggy), a 400 level student of the depertment of Micro Biology of ABSU and the then leader of Burkina Faso (BF) in ABSU who was killed allegedly by members of maphite on 22nd February,2016. He narrated that he was present at the meeting where the attack was planned, and that he played the role of gate keeper at the Lodge during the attack. He emphasized that he was to watch the entrance of the lodge and alert the attackers if security agents are approaching the venue. Obi (a.k.a Small Body) an indigene of Uturu and member of BF is not a student, but “Okirika” seller in Port Harcourt, Rivers State. He equally confessed to have taken part in the planning and execution of the dastardly act. He stated that he partook in the shooting and actual beheading of their victims. He further stated that CHIGOZIRIM the third victim was also shot but was not beheaded because he claimed he was a member of Vikings cult group and not Maphite. Obi also disclosed that himself and AWOM with others still at large partook in the dropping of the served head at the frontage of the University Campus gate. EBERENDU, a.k.a Star Boy, aged 23 years, is a final year Accounting student of ABSU who succeeded Biggy as BF No.1. He admitted that he was present on 22nd February, 2016 when BF and Maphites had a shootout that led to the death of Biggy. He said that after his death, the mantle of leadership fell on him. He also disclosed that series of meetings were held in Olokoro in Umuahia South LGA, Abia state and Owerri, Imo state where the plots to avenge the death of Biggy were concluded and gave graphic details of how that plot was executed. He confessed that he was part of the planning and the beheading of the two (2) Maphites members on 12th march, 2016. At this juncture, the command would want to remind members of various Cult groups and other criminal gangs operating in the state that the long arm of the law will always catch up with them no matter how long the crime was committed. The Command is assuring members of the public of their continued safty and urge them to always cooperate with security agencies in the provision of useful information that would help in tracking down criminals in their midst, as security is collective responsibility.